Carlos Saliente is the sole authorised distributor and installer of ThermaSkirt in Andalucia. ThermaSkirt is a skirting board that heats your home. It combines the responsiveness and simplicity of radiators, with the comfort and space saving of under floor heating. 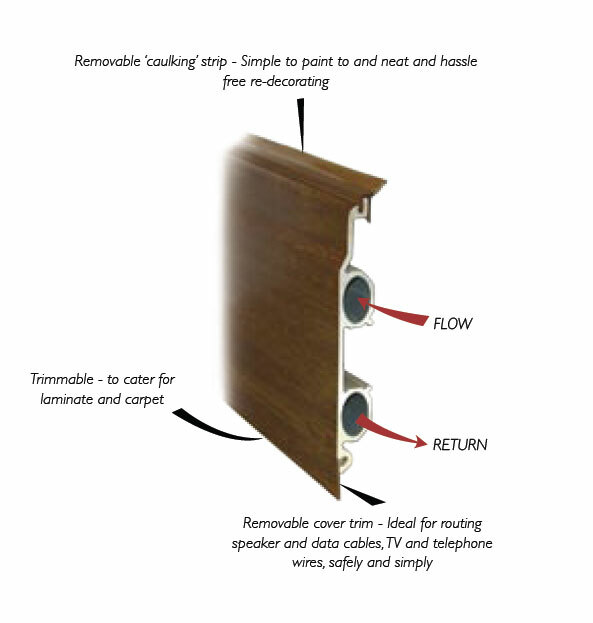 ThermaSkirt is a high tech alloy polymer extrusion that replaces the skirting boards and radiators in one. Warm water flows through the patented integral oval tubes and heats the skirting front. This distributes the heat quickly and evenly all around the room, at low level – just like under floor heating. In addition, it frees up your wall space to maximise your usable living area. What are the benefits of ThermaSkirt? ThermaSkirt can make the room feel comfortable at lower operating temperatures. This can save up to 25% on your annual heating costs and significantly reduce your carbon footprint. ThermaSkirt is able to respond in minutes, whatever your floor construction or finish, and being able to control the heating so quickly enables you to use just enough energy, only when you need it. This can also help reduce your fuel bills. The larger surface area afforded by ThermaSkirt enables renewables such as solar panels or heat pump system to be used. As it is fitted ‘above ground’ it can be installed in many more existing buildings - something that would be impossible without the upheaval required to fit underfloor heating.